That headset would be the Ear Force PX5, a pair of headphones designed with the PlayStation 3 in mind. (It's also Xbox 360 compatible.) At $249 USD, it's the priciest of the bunch that we sampled. But the PX5 sounds stellar, even amidst the din of the packed CES show floor, touting Dolby 5.1/7.1 surround sound and uncompressed wireless digital audio. The PX5 also sports customizable DSP settings—up to 18 personalized presets—that can boost selected audio. In the demo we were given at CES, Turtle Beach reps illustrated this by honing in on the sounds of footsteps with one preset, the ring of shell casings hitting the ground with another. Cycling through those presets can be done with the touch of a button on the left earpiece. That said, there's an impressive number of buttons, dials and switches on the PX5. Managing its many functions will likely take some getting used to. Players will be able to program their own presets on the PX5 with a GUI based editor for the PC and share customized presets online with others. The editor will be available for Windows based computers at launch, Mac platforms later. One of the most desirable features of the PX5 was its Bluetooth tech. 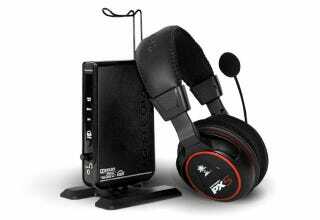 Turtle Beach's top of the line PS3 headset features a dual-pairing option, letting players use the built-in microphone boom as a Bluetooth headset and pair the headphones with another device. During our demo, we listened to the soothing sounds of a Halo: Reach firefight while also receiving a call via a paired iPhone. The PX5 attenuated the game audio down to a more reasonable volume while on the call, making talking while playing easy. Perfect for lazy people who prefer their gaming happen in long, uninterrupted stretches. The PX5 certainly felt like a $250 pair of headphones, with a quality build, the right amount of heft and cushioned ear cups that felt like a delight to wear. Unfortunately, we didn't get a chance to sample some of its chat-based features, something that will have to wait for a review. The list of features packed into the PX5 is long, so read more about it at the official page on Turtle Beach's web site. The headset is planned for a March 2011 release. For the more budget conscious PlayStation 3 owner, the company's Ear Force P11 may be the better option. This is the PS3 equivalent of Turtle Beach's X11, which is designed with the Xbox 360 in mind. Both cost $59.95 USD. The P11 has a limited number of frills, but it does feature independent volume control for mixing game audio and USB chat audio to your liking, as well as crisp, clear audio via 50mm speakers. The P11 is also PC compatible, if you're looking for a multi-purpose headset. Expect that option to ship in April. Finally, we got a chance to try out the Ear Force XC1, the simplest and cheapest option of the lot. Think of this as a replacement for the unimpressive Xbox 360 Headset that Microsoft sells for $19.99 USD. For five more bucks, this thing offers a much more comfortable solution and a superior earpiece that won't block out the audio coming from your sound system. The XC1 also deploys in April. Obviously, the best option of the three was the feature-rich Ear Force PX5, but if you don't have the hundreds of dollars to drop on the thing, you have other options.